Using hand-held vacuum technology to lift loads safely, ZUEDA's range of suction cups provide fast attachment to flat and smooth surface. These lightweight and durable manual lifting aids provide sturdy, reliable hold for accurately moving and positioning glass panels, cladding materials, metals, ceramics, household appliances and office furniture. The versatile and lightweight 4.8" small hand suction cup comes with 77lbs. 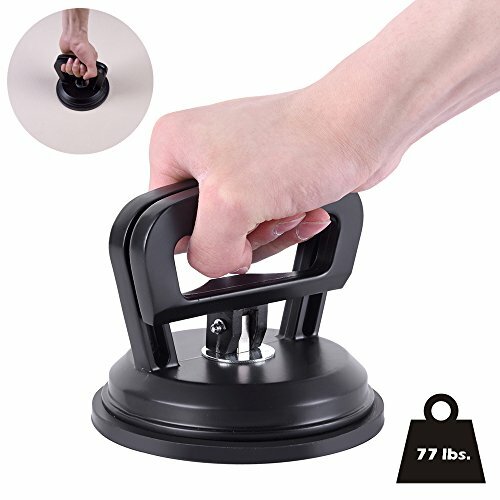 (35kg) of lifting power and butterfly handle for easy setting and leveling of double glazed windows, mirrors, sheet metal, non-porous tiles and more. Do not exceed the safe load capacity. The suction cup lifter could only be operated manually for short distance. The hand cup should be only used on non-porous materials with smooth, relatively flat surface. If there's any concerns about a condition being safe or unsafe, DO NOT use the product. If you have any questions about this product by ZUEDA, contact us by completing and submitting the form below. If you are looking for a specif part number, please include it with your message.